Late last year, an album was released on Kokeshi that blew our minds, so today we are happy to welcome it’s creator, Irrelevant, to the mixtape series. I’ve been preaching the ways of this album ever since I reviewed it, and it’s still hugely underrated in my opinion. 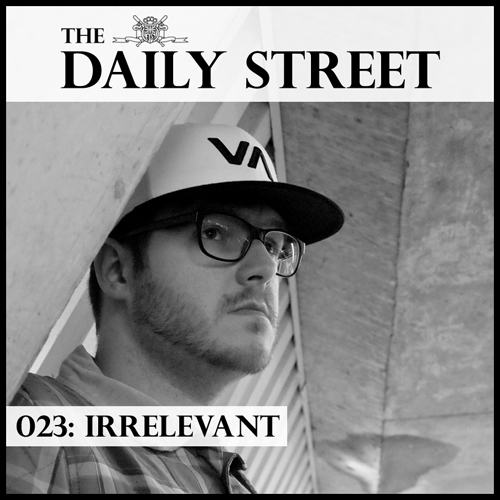 Irrelevant is a strangely unique artist, taking huge influence from deep Garage inspired Dubstep, as well as Berlin’s Dub Techno and coming out with what sound like if Burial had grown up on Techno rather than Garage. This mix reflects that, more so than I thought it would, as Irrelevent smoothly moves between songs from the likes of Synkro, Akkord, Blue Daisy, Ghostek and of course himself. He actually made a whole track especially for this mix, aptly titled “Daily”. Something that is a first for us here at TDS. To sum up the mix as a whole, it is quite simply beautiful. I could ramble on about this artist all day, so I suggest you read his own explanations below, listen to the mix, play it on loop for a week and buy his album if you haven’t already. Here’s to the very bright future of a true UK talent. The mix essentially encompasses the ‘lighter’ side of music that I’m feeling at the moment, definitely not what I would play in a club set. I wanted it to be something that could be enjoyed post club with headphones on whilst you enjoy your favourite après club poison, whatever that may be. My favourite track is probably “Feathered Skies” by Ghostek, been feeling that tune for so long now and it hasn’t even begun to get slightly old. The mix was done in Ableton with some VSTs and effects. I enjoy taking time to really create a soundscape that isn’t always possible with a straight deck to deck mix. Is style/fashion important to you? Yeah I’m a massive fashion whore, I love my labels. I’ve always been a huge fan of Adidas Originals but others would be Obey, Weekday, Iriedaily, Droneboy, 500 Godz, DBD, Supra and Lazy Oaf. The list could be massive though. I’ve still got so many unreleased tunes that are either leftovers from the album cut for “I’ll Be OK” or other bits that haven’t seen light yet, so hopefully there will be the opportunity for those to get out there. And I’m looking forward to some collabs with some cool artists this year too. It’s really down to what Alley Cat at Kokeshi wants to do with me for now. I owe her a lot for the faith and support she’s shown me, so she gets first dibs! I’m happy just to wait and see, I like not knowing whats gonna happen next. His next release is on the Kokeshi Kompilation due out this summer..i think he forgot ! Ooops, yes that is correct!